Music is a super companion for humans, which can make you relaxing and enjoy colorful life. A portable music player device is essential for music lover. We are be honored to recommend X2T Stereo Bluetooth Headphones to you. X2T Bluetooth Headphone is specially designed for music lovers and sports enthusiast, which features Advanced Bluetooth 4.2 (CSR4.2) technology, Built-in high-grade Microphone & Speaker, hands-free function and lightweight design. X2T Bluetooth Headphone will offer you wonderful music, you can greatly enjoy your favorite Music. A super companion for you during daily life and travel. 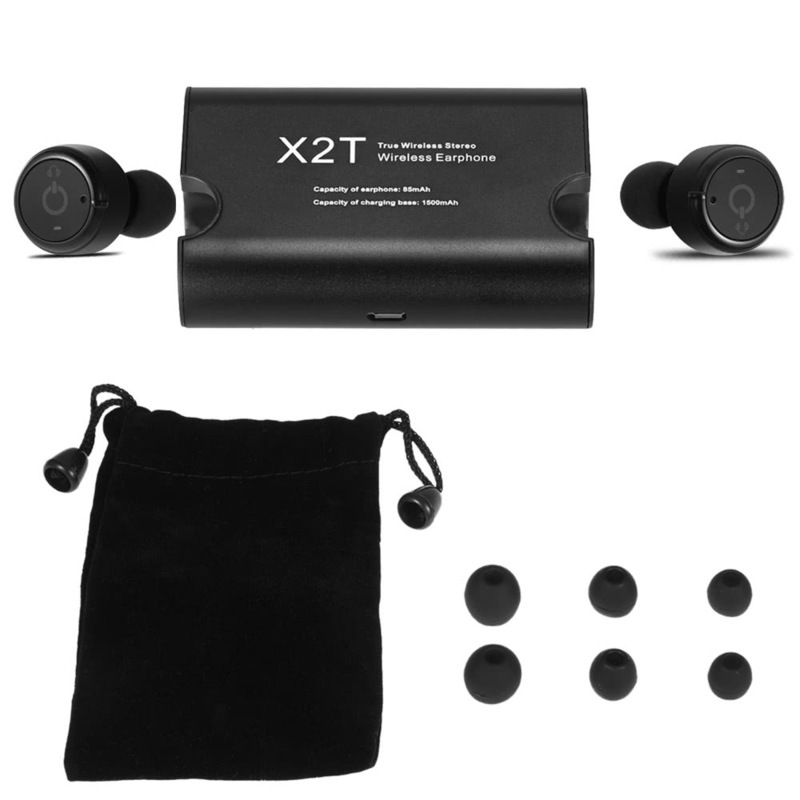 Wireless Dual Ear Stereo Design, Left and Right Ear Channel Separation; You can use X2T's Left and Right Ear Headset solely (Single Track Mode), and X2T also can be used in pairs (Stereo Mode). Ultra Mini Size(its diameter is only 16mm), offering you Wonderful HiFi Sound Effect. Its ergonomic design guarantees 100% Stable and Comfortable when walking, exercising, running, climbing, driving, skating, cycling, fishing and other outdoor sports. Simply put your earbuds near the charging interface and they will be held in place magnetically and recharge. Comes with 1500mAh Charging Box which can charge these earbuds for 10 times, keeping you enjoying wonderful music all day without any worry for low battery. Latest Wireless Bluetooth 4.2 (CSR4.2) Technology with A2DP/ AVRCP support, ensure transmitting strong signal in high quality & high speed and offering high-fidelity stereo music. Adopts CVC6.0 Noise Canceling Technology and high-sensitivity microphone to reduces ambient noises and grasp the detail of voice, enabling clearer sound from microphone. With a wireless audio range of 66ft (20m), enjoy the freedom to move and the convenience of uncompromising sound quality. And can simultaneously connect two smarts phone. So you can seamlessly switch between your business and personal phones. Built-in rechargeable Lithium battery lasts up to 8 hours of Talking Time / 6 hours of Music Playing Time and 120 hours of Standby Time per charge cycle. And universally compatible with most Bluetooth-enabled devices, including iOS / Android / Windows Smart phones & Tablet PC and other Bluetooth devices. Also Supports real time monitoring of battery voltage and early warning of low voltage, also support auto power-off when ultra-low voltage. Bluetooth Version: Bluetooth 4.2 + EDR; Class 2.